When thinking of Navajo textiles, one may be inclined to consider works of great intricacy and beauty. Imbued with cultural energy by those whose hands labor to craft them, Navajo weavings are visually striking and instantly recognizable. It may be easy to assume, moreover, that understanding such creations is simply a matter of aesthetics. The Brigham Young University Museum of Art’s newest exhibition Weaving the Unexpected: Navajo Pictorials from the Lucke Collection defies the common assertion that these weavings are merely decorative. In fact, the works boldly not only attest to the superb method of their creation, but also to a poignant message contained within their subjects. An unexpected range of pictorial subjects emerges from this collection, with weavings featuring cars, trains and soda cans. These subjects are surprisingly reminiscent of the Pop art movement, and affirm an artistic process that is open and actively adapting to modern times. The Navajo Nation is recognized as the largest Native American tribe in the United States, with over 300,000 members living throughout the nation. The overwhelming majority of Navajo reside in the southwestern United States, where their cultural traditions are embedded in the local collective consciousness. 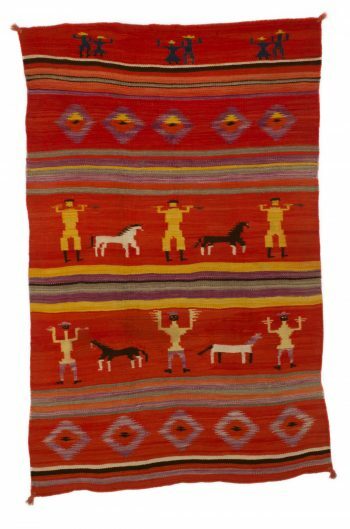 Encounters with Spanish colonialists precipitated what would eventually become a Navajo artistic staple: weaving. As the trade of sheep largely replaced the agricultural traditions of pre-Colonial life, the Navajo quickly asserted unimaginable creativity and resourcefulness, fashioning rugs, blankets and clothing from wool. The ensuing history tells of a myriad of designs and colors that mark the distinctive Navajo varieties known throughout the world today — largely comprised of horizontal stripes, repeating patterns and complimentary dyed strands. Most people, however, are unfamiliar with the notion of ‘modern’ Navajo weaving. One example of this modern spin on a centuries-long tradition is ‘Buffalo Soldiers,” 49 x 76 in, c. 1880-1885, one of the exhibition’s most striking pieces. A large, predominantly red weaving hung vertically and marked with multi-colored horizontal bands that sequester sections of the vertical whole, the weaving is adorned with human figures and animals. While diamond shaped geometric patterns intersect the row of figures, the patterns are not as visually arresting as the figures that frontally face the viewer. Even in the lack of ornate repetitive patterns, one can detect an underlying rhythm in this work. This is accentuated by the stylized figures who have their arms raised in an outward gesture and who are accompanied by profile views of horses flanking each side. This context accounts for the seemingly unusual subjects present in this collection. An additional weaving in the exhibition, “Five Trains,” c. 1885-1890, 30 x 51 in, is filled from top to bottom with intersecting forms. 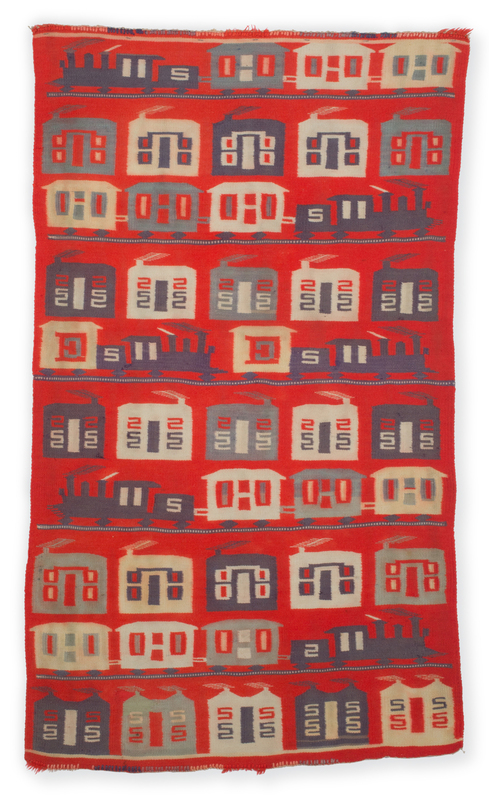 The forms in this case are trains, boxcars and houses oscillating in color on the gray scale. Like most of the works in the exhibition, the rug is hung vertically, yet its contents radiate in horizontal registers. The forms are beautifully rendered in diverse symmetrical forms and appear striking on the blood-red background. The inclusion of stereotypically modern subjects provides fascinating insight into the rapidly changing social environment faced by citizens throughout the United States. Just as modern artists in Europe were beginning to break away from academic tradition, so to were Native American artists willing to embark on new visual horizons. Art maintains a remarkable ability to change and augment our perceptions of different cultures and traditions. As a title, “Weaving the Unexpected” anticipates the exhibition’s capacity for redefining what is typically known about this subject. The works contained in this show present remarkable craftsmanship and skill in their own right, made even more impressive when given the added layer of modernity. This article was published in the May 2015 edition of 15 Bytes. Scotti Hill received her Juris Doctorate from the S.J. Quinney College of Law in 2018, with a certificate in intellectual property law. She previously received a Master’s and a Bachelor’s Degree in Art History and taught art history courses at Westminster College and the University of Utah. She continues to write for 15 Bytes and the Deseret News.